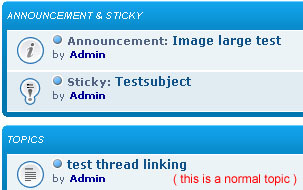 Sticky: A sticky is a topic of greater importance. It stays on the top of the other topics at all times. It usually contains rules or other important information that your members can easily find. 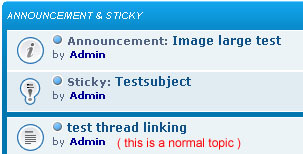 Announcement: Technically the same as a sticky, but they will be on the top of other topics and stickies regardless of their date of creation or amount of replies. Announcements, as the name implies already, are usually used to announce updates or other news. How to create a Sticky / Announcement? How can I define other names for stickies and announcements? 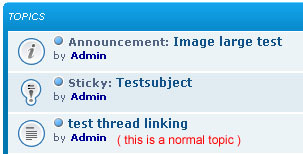 You can modify the name of stickies and announcements so these words are displayed on your forum instead. This option allows you a higher level of customization and individuality. "General >> Forum >> Messages & Email >> Define another name for stickies / announcements"
Notice: The maximum length is 15 characters for the personal texts. For this reason, it's recommended to avoid html tags. How to change their topic icons? This can be done in the "Display" tab in your admin panel. Go ahead to "Pics Management", "Advanced mode" and switch to the "Icons for Topics". Enter a new image address into the respective fields and save. Can they be separated from normal topics? "General >> Forum >> Messages & Email >> Separate annoucements and stickies from the messages"
This tutorial was written by Metal Knight.